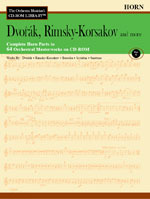 The Complete Trombone, Euphonium and Tuba Parts to 64 Orchestral Masterworks on one CD-ROM. If these parts were purchased separately, this collection would easily cost $500.00 or more. Works are viewable and printable on either PC or Macintosh. No access codes or special software is required. The CD employs Adobe Acrobat Reader technology which is included on the CD. Contents: BORODIN Symphony No. 2, On the Steppes of Cental Asia, Polovtsian Dances; DVORAK 9 Symphonies, 3 Concertos, 5 Overtures, Symphonic Variations, Tone Poems, Romance in F Minor, Serenade for Strings (47 works); RIMSKY-KORSAKOV Scheherazade, 2 Symphonies, Christmas Eve Suite, Sadko, Tsar's Bride Overture, Capriccio Espagnole, Russian Easter Overture, Mlada Suite (incl. Procession of the Nobles), Le Coq d'Or Suite; SCRIABIN 5 Symphonies, Piano Concerto in F# Minor; SMETANA Ma Vlast (complete), Bartered Bride Overture and Dances, Hakon Jarl, Richard III, Wallenstein's Camp.